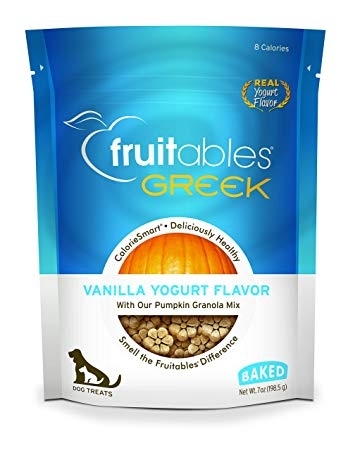 Fruitables Greek Vanilla Yogurt Flavor Crunchy Dog Treats combine healthy ingredients with a crunch that drives pups wild. 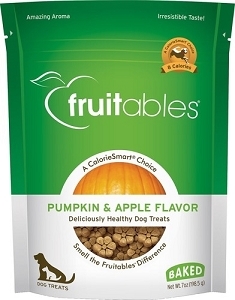 This low-calorie treat provides a guilt-free way to reward your dog with the tempting tastes of fresh vanilla, real Greek yogurt and pumpkin granola for added crunch. Made with a limited list of ingredients, this simple recipe is full of nutrients and nothing artificial. 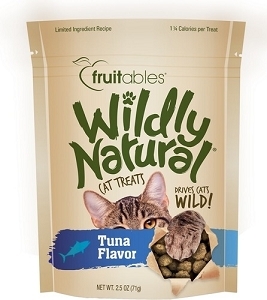 Natural antioxidants and dietary fiber will keep your four-legged friend feeling great while the delicious flavor keeps him excited for snack time. 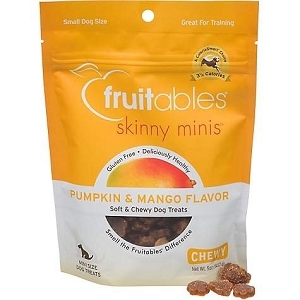 This combination of real GREEK yogurt, creamy vanilla, and our own deliciously healthy pumpkin granola creates a smooth yet crunchy delight that provides a calming break to a hectic day of chasing squirrels. Only 9 Calories; made with simple all natural ingredients. Pumpkin Granola (Oats, Barley, Brown Rice, Pumpkin, Honey), Greek Yogurt, Sunflower Oil, Natural Flavor, Vanilla, Mixed Tocopherols (to preserve freshness).